Minister | Jonathan W. Allen, Sr.
Pastor Jonathan W. Allen Sr. co-founded Allen Ministries with his partner for life, Pastor Kimberly Reeder Allen. 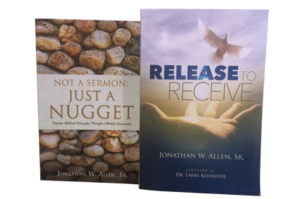 Through Allen Ministries and several programs and events, Pastor Jonathan Allen seeks to change lives and save souls. There are several communities served by Allen Ministries, including men, women, couples, children, and Christian-based businesses. The Men’s Ministry, also known as MASS (Men Anointed, Saved, and Serving), seeks to develop males of all ages who are willing to be their brother’s keeper. Holding each other accountable, being accessible, and available are just a few attributes that will be gained from group participation. Men will be taught to be Godly leaders in their homes, church, school, and in their communities. This is a safe place for men who have a desire to serve God, to have a deeper relationship with God and to give back to their community and to excel. He’s In Me (H.I.M.) is the Allen Ministries outreach to women. H.I.M. Women’s Ministry provides an environment for women to receive support for mental, emotional, spiritual, and physical healing as well as receive direction to enhance their Christian faith. H.I.M. meets every other month. Pastor Kimberly Reeder Allen directs the H.I.M. Ministry. Couples Strengthening Couples (CSC) is a ministry that focuses on married couples in every stage of their marriage from newlyweds to couples who have been together for years. It is the mission of Couples Strengthening Couples to take married couples to a higher level through monthly Godly fellowships. Through these fellowships, we focus on imparting a Godly positive impact that will elevate each couple to a higher level in their personal walk with God and their walk with their mate for life. For over 16 years, the Allens have conducted Camp Holiday. Camp Holiday is a tuition free annual summer camp that is run by Pastor Kim. During this time, the children are instructed in life skills, biblical lessons and general education within their age/grade level. In addition, there are recreational activities such as: swimming, kickball, jump rope, etc. that provide physical stimulation. Each week campers visit a museum or other local attractions. At the conclusion of the camp the campers display their artistic talent in a talent show for family and friends. Pastor Allen combines his ministry with his heart for entrepreneurism through Gospel Business Connection. The purpose of Gospel Business Connection (GBC) is to teach those with entrepreneurial desires how to successfully own and manage a business with integrity. GBC is also a networking connection where you are introduced to other business owners and are able to forge relationships that may challenge you to move your business to the next level. Whether you have an existing business or are in a business startup phase, GBC has something to offer you. Through Pastor Allen’s leadership, he brings years of experience as a business owner in corporate America and has been led by God to impart his experiences to business forerunners today. 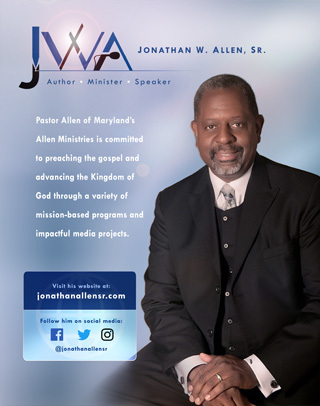 In addition to the programs and ministries rendered through Allen Ministries, Pastor Jonathan W. Allen, Sr. preaches throughout the country and undergirds his various speaking topics with the Word of God. He especially focuses on family, finances, and fiscal stability through business ownership.